If you have time, would you please give me advice? I want to buy a .22 pistol for CMP bullseye matches and .22 EIC matches. I want to shoot iron sights only, so I can train for .22 EIC and maybe have a chance of winning some day. I am currently borrowing a friend's Beretta model 87 target pistol. It's phenomenal. However, it costs $930 + tax, and I don't want to spend that much money. Can you please help me decide on a good bullseye pistol that is less money, without sacrificing too much accuracy? I want to be able to win .22 EIC matches, so I don't want to buy junk just because it's cheap. I saw a Ruger 22/45 MK III in a store today for $299 + tax. It was new and had removable grip panels. Is that a good deal? Are those pistols accurate? The gun store said they would soon be getting in Ruger 22/45 Lite Mk 4 series pistols for about $500. But can I use the Lite series in EIC matches? It has slots/holes drilled in the barrel shroud. Rule 6.2.6 of the CMP rules says I can't have a muzzle brake or compensator, but it doesn't say the barrel shroud (if that's the right terminology) can't have holes drilled to reduce weight. Am I wrong to pursue the 22/45 Lite? Is it inaccurate compared to the standard 22/45? Thank you in advance for any advice you could offer! i bought a 2006 marvel unit 1 with two ribs,one scope mount and other with iron sights. one dedicated lower is my next project. But there's a chance that the zero will change when you switch the ribs and then switch them back. How do u like the Nelson Conversions, javaduke ? I need to buy a Conversion. Sounds like a sweet set up. Gotta love the 1911. Sharing is tough... and why we ended up buying the Ruger Mark IV Lite. My father & I went to a Bullseye Clinic Together. I ended up taking from out underneath his nose Everyone's fav to shoot - ?High Standard? w/ Custom red dot (been shooting for years not seriously @ 25 yards with worse vision), he was left with this nighthawk conversion on the Colt .45. Iron sights. "You stole my Gun". I had to. He had Cataract Sx, I haven't yet! BUT, he took that nice set up to PA, and I'm here in FL. I was actually looking at the "All Sight" today. Have you given that any thought? The newer version You can just pop on & off. Certainly no Ultradot, but could be an ez alternative. I really really like them. Top notch quality, very reliable, eat pretty much any ammo I feed them, and dead accurate. Does Marvel only come one or the other? Not Iron sites with Rail Mounting to accept RDot? May I ask what yu paid for a used unit? I have scope rib and sight rib. I bought used because is lighty used, .647" at 50 yards and was a excellent deal. I am NOT Defending MY NEW RUGER. Had I known about all these little idiosyncrasies, I would have kept looking...but it's my first purchase, & an ok Starter. It is as light as a cloud tho, makes up for nasty trigger. I completely agree on the 1911 Conversion. That's why I put my "Story" on... Dad has and had a couple 1911's, nothing very fancy, just Classic. But I am a believer in, you buy it, you are Stuck with it. I haven't got to 50 yards yet, man, that will be a great day! Wait, aren't 8's and 7s better than 6's? Hey, I'd be pretty happy with those at 50. Very nice. Exactly what I need ! I would settle for 1. U done good. They keep their Value. I see used for 450, New 560 ish. After talking to Nelson, I ordered a second barrel for my conversion. He showed how quickly you can swap out the barrel/ribs and only need one conversion for irons and optics. +1 on S&W Mod 41. I have an older one that I've now got back in working order and it is a very nice gun to shoot with irons. I use a Nelson Conversion with a dot but with irons it's too light for me. I like a little more weight in the gun. The 41 fits the bill for me for an iron sighted 22. I've only shot one 22 EIC match and I didn't do well - I was using the Nelson. I didn't do well because the Nelson is a bad rig, it's not. It's an excellent piece of equipment. Like I said it's too light of a gun for me without a dot. That's why I like the 41 with irons. I use the shorter barrel. Tim:H11 wrote: +1 on S&W Mod 41. I have an older one that I've now got back in working order and it is a very nice gun to shoot with irons. I use a Nelson Conversion with a dot but with irons it's too light for me. I like a little more weight in the gun. 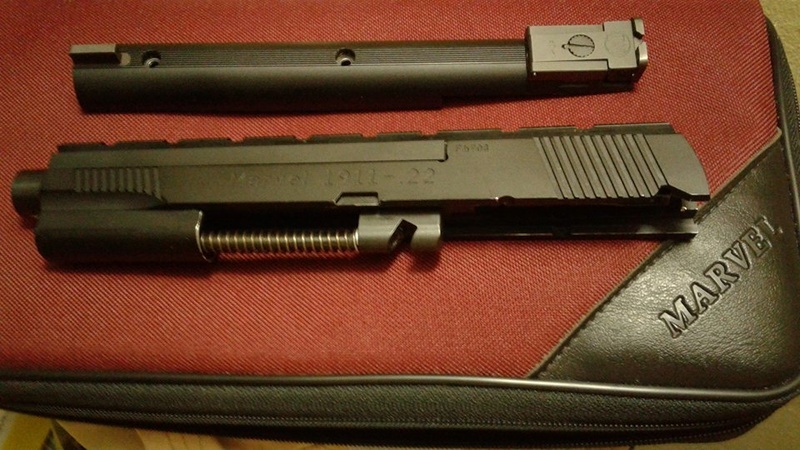 The 41 fits the bill for me for an iron sighted 22. I've only shot one 22 EIC match and I didn't do well - I was using the Nelson. I didn't do well because the Nelson is a bad rig, it's not. It's an excellent piece of equipment. Like I said it's too light of a gun for me without a dot. That's why I like the 41 with irons. I use the shorter barrel. Congrats on Master in under are year brother!! Good luck at muzzle loading nationals! Chris Miceli wrote: Congrats on Master in under are year brother!! Good luck at muzzle loading nationals! Well, to be honest about my track record I had never attended or participated in a Bullseye match of any kind until October 2015. Last local monthly match. I had only a 22 and needed to work that afternoon so I showed up to see what the game was all about, shot the 22 agg and left. First time shooting the game, and first time shooting turning targets. Shot 869 with a S&W M41. The season ended and I gave Bullseye some thought over the fall and winter. I then gave it another go March 2016, again 22 agg only then left to go work range Officer at another range. Still didn't have a 45. Just 22. Shot 859. I was focousing on muzzleloaders so I didn't go back again until July 2016 and shot another 22 agg only 862. By then I was hooked. Had to get a 45. Had to be part of this sport. I shot my first full 2700 in August 2016 and with that plus my previous scores had enough to become classified. It was a war from getting my Expert card after that first 2700 to getting my master card. But I had shot some - the 22 only attendances I made prior - so really more than a year from my introduction to the sport to getting master. But thank you all the same for the shout out. I appreciate that. from a personal standpoint, I wouldn't recommend a light pistol, generally not the best for bull's-eye shooting. For the money, I would recommend a used Smith and Wesson 41. Reasonably priced, triggers don't need any work, and everybody in the universe makes accessories for them. Plus they are still in production so parts are readily available. They are very easy to field strip, and multiple barrels configurations are easily available and swapped out. I think part of the fun is buying several 22 pistols in search of the perfect one! Thank you for your comments, everyone. I'm deployed right now, so there's no chance for me to do any bullseye shooting. They didn't issue me a pistol, so I can't practice dry-firing. I'm in comm and they don't issue us guns unless we're outside the wire. I'm not even allowed to have an air pistol or even a toy pistol here. I can't wait to go back home. Although I don't know what state I'll be going to (very likely Mississippi though). I really wish I could go back to Colorado but it doesn't look likely. I don't know if any of you are from Mississippi? I got a Nelson conversion before I left, and I've decided to shoot with that on my 1911 frame. Really looking forward to going home and getting back into the sport. I got an idea from someone at a competition. He said he shot nothing but .22 rimfire for a whole year. I'm thinking about just putting EIC service pistol on hold, and just shooting the Nelson conversion, rimfire only, for a year or two, until my scores get a little higher. My highest score in an EIC match was 235. And that's not high enough to win a service pistol match, and I figure if I can't do it with rimfire, I can't do it with centerfire either. But having the Nelson conversion on my 1911 gives me practice with the same trigger and the same "feel" of the pistol. 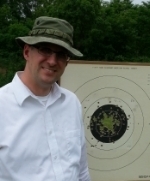 When I get my rimfire scores up above 250, then I'll start shooting service pistol matches again. In the meantime, I might as well save money and just do rimfire for a while. Someone gave me a good idea to try to keep my skills sharp. Since I can't even own a toy gun here, I've been practicing my pistol hold with a 4 lb dumbbell at the gym. I get in my shooting stance and hold it sort of like I'd hold a pistol, while looking at the top of the weight just like I'd look at the sights, and try to keep it steady. I do a few sets every time I use the gym. Hopefully I'm not too rusty when I get home. What I wanted to do was get a plastic toy 1911 with a trigger that you can pull and makes a clicking sound, then fill the inside up with lead fishing sinkers. At least that would let me practice my hold. I have to make do with what I'm allowed to have though.